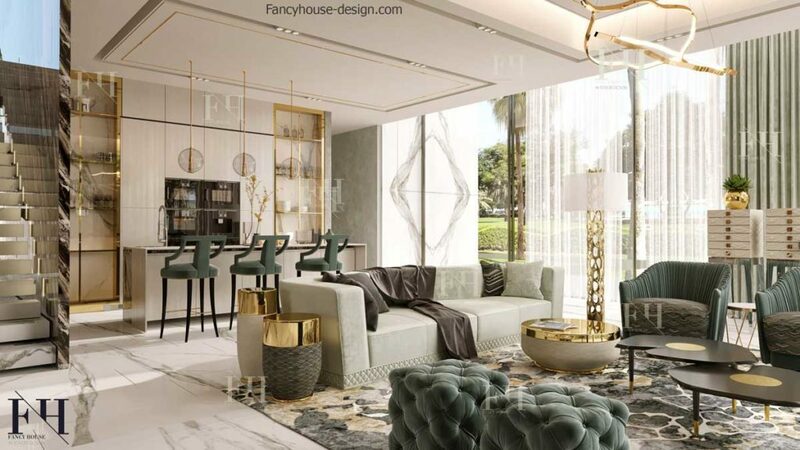 Fancy House is one of the best luxury modern villa interior design companies in Dubai. We create solutions of any complexity and any size. Having your own large and luxurious residence, you are free to dispose of its space exactly as you wish. It allows to realize the most unexpected solutions. We are pleased to create that for you. 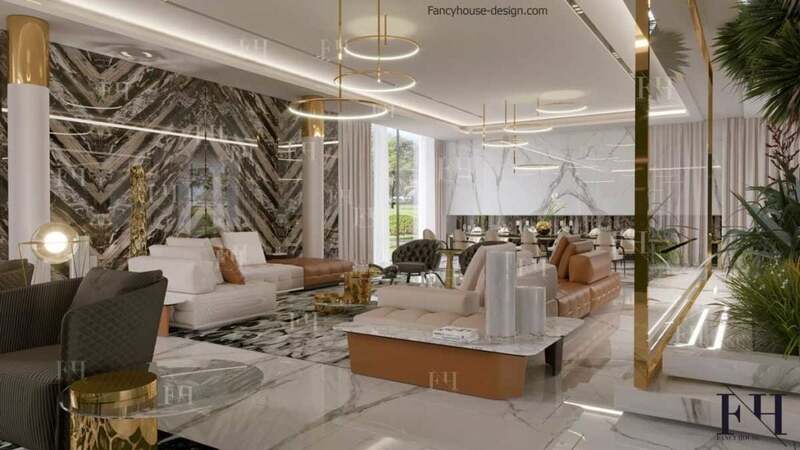 Magnificent villa was designed by out team for the client in Dubai. The house is full of advanced technologies and new approaches, that give a very luxurious look, however are more affordable than traditional ones. The concept of open space is realized here: a minimum of walls, large windows in full height and unity of finish inside and outside the building. Look at carrara marble stone on the wall. Here is realized an idea of a single decorative solution for the interior and exterior of the house. The same marble is used outside and inside by combining space. The ground floor is the face of the house. This house is not strictly divided to guest and family parts. Formal living & family sitting with a comfortable show kitchen allocated in entire space separated only with transparent enough main staircase. Family dining made as a kitchen island with a bar. This planning solution allows to have an excellent view to a swimming pool trough large full height windows. We recommend to keep a single & harmonious concept throughout the ground floor of the mansion. Designing of the villa is a great creative work: unlike standard apartments, it is necessary to take into account the large structural elements, the peculiarities of the arrangement of staircases, entrance zones, terraces, fireplaces and even a view from the windows. Large areas allow realizing effective interior solutions in reality. 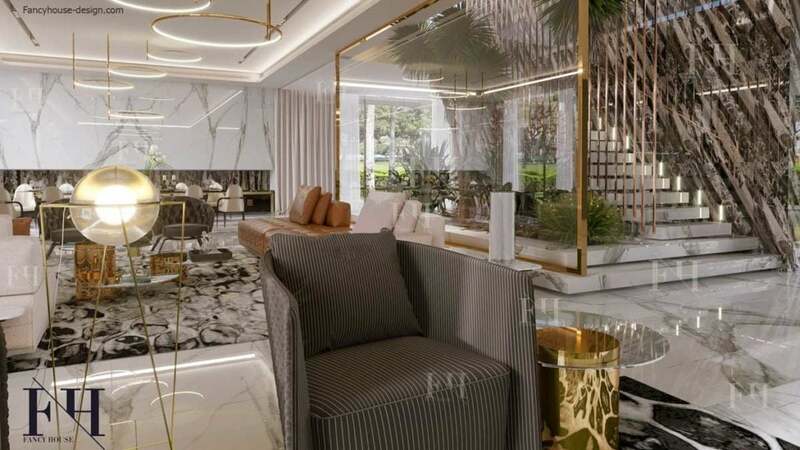 It can be classic or luxury modern villa design in trend of 2019 year in Dubai. Interested to get prices? It is available on the website, just click the button. We combine latest decoration ideas to a complete concept. A dream home begins with a professional planning. Our designers will create a perfect one according to your nature and requirements. Our prices are fixed and open for you. We do not hide or play with prices: you will find the same amount here on the website & in your contract. To be transparent for a client is a base of our reliable relationship. It includes a full interior design project with 3D visualizations, drawings, selection of furniture and materials. If the villa size is from 500 to 700 sq.meters, it costs AED 150 per sq.m. AED 130 is the price for 700 – 1000 sq. meters houses. For projects from 1000 sq.m. our company offers AED 110 per sq. 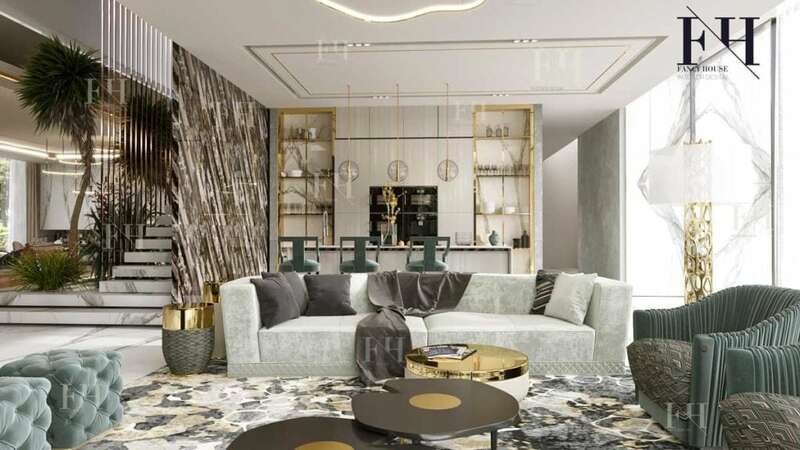 m.
What is the interior design project? It is a full set of documents is required to make a bespoke luxury villa interior design from a concept creation to ready to live house. We provide all technical documentations for high quality execution. If you want to get a cost estimate, you just need to fill out the form on the left. Indicate a property type: a villa, an apartment etc. Choose the preferred style: you would like more classical with details or modern style, when the luxurious effect is created by the selection of clean materials. Choose the size of your home in square meters. If you do not know, please indicate roughly or simply describe your property in the comment field. (The number of floors, the main rooms). Write, please, where the property located: city, district. Please choose you need a design project or fit out execution, or both services. Are you interested to get more information or to discuss your project? Write to us your questions via this form.